The book is also available as a hardcover, e-book and audio-book. Whenever I have some time to kill, I can never help but wander through the bookshop at the train station with the bestsellers and momentarily popular range of books. I usuall try not to buy anything, as I already possess a mysteriously growing pile of ‘yet to read’ books. But when I laid eyes on massive golden letters on a spine that slightly resembled a marble pillar, I was intrigued. ‘MYTHOS’, it said. And ‘Stephen Fry’. Before even reading the back cover I was immediately sucked into the skilful cover illustration of a girl, kneeling in front of a big jar, undoing its lid. Flying out of it emerge all kinds of little creatures and critters, mocking the girl and displaying a will to do no good. Pandora, the first woman in the Greek creation myth, the All-Gifted. Being a comedian, actor, presenter, activist and tech-blogger and writer, Fry surely possesses many gifts too. Though I’ve always aspired to read some of his novels, I never did. Until he picked my favourite pantheon for his latest publication. 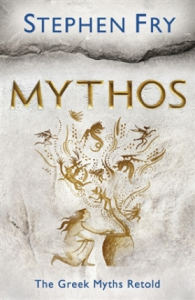 Coincidentally his retelling of the Greek myths followed shortly after Neil Gaiman’s retelling of the Norse myths. Like Gaiman, Fry uses contemporary language. But where Gaiman is hidden as an author, Fry stays present, providing commentary and context. Fry demonstrates how these old stories are still relevant for us today by cleverly interweaving them with remarks on modern science, technology. He even goes on to demonstrate that these myths are still very much alive in our language as words or sayings and how they inspired other works of literature. So in that sense, the book not only explains the Old World to us but also the world around us. Like the Gods it describes, the book is not flawless. For instance, there is no table of contents and no index. So it’s hard to find your way around and difficult to find the specific chapter you’re looking for. And you could say that the selection of the stories about humans, ‘The Toys of Zeus’, is random or that some well-known stories like the Trojan War and the tales of Hercules are only mentioned briefly. But none of that matters, because the stories that are told are likely to touch you in one way or another. Whether it is the choice of words or the insight into the characters that achieve this, I do not know. But I do know that some of these stories will stay with me and that I have gained greater insight – on many levels. And that’s just it: Some books are read for information. Others are read to delight and stir the soul in recognition. 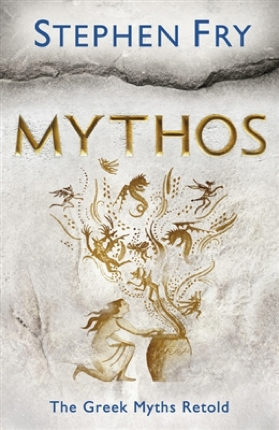 Stephen Fry’s Mythos is one of them.